We’re interviewing the Makers you’ll meet at at Maker Fest 2019 on Saturday, February 23 so you can get to know them ahead of time! If reading about Michelle’s work has inspired you to share your own, sign up here to be a Maker yourself! Having had a brain tumor that compromises my ability to do certain things, I find that having been told I am completely impractical–and now being able to function normally–I have an inner strength to try my hand at things that I have been told I can’t do or am no good at. I am inspired by bending down in the garden, in a parking lot, or wherever, and seeing this beautiful nature all around us. It could be as simple as this morning, with a few snow flakes coming down, and seeing them one by one land on our black truck, absolutely amazingly perfect. Or it could be sitting in the garden listening to the hum drum of the bugs in the middle of summer, and having a butterfly come and land on me and stay there for half an hour or so, or chatting with a tame blue jay! I started by trying to paint butterflies on rocks, having read about the village members in Mexico selling rocks to tourists, to try and raise awareness of the Monarch butterfly. I donated the money that I raised to the Monarch lab at the U of M, and branched out by painting a swallowtail, caterpillars, hearts, you name it! 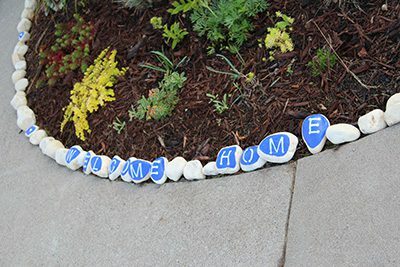 I recently did a project for an MPA staff member, painting rocks and sayings, which was such an amazing thoughtful gift from the staff member to friends. I love anything organic; rocks, especially when I know their origins (from my husband’s parents homestead for example) connect me to the land. I love finding twigs and stones, which can help draw a person back to nature, as well as make pictures of nature using fabric. I think I would paint lots and lots of rocks, and put motivational sayings on them. I’d dot them all around surrounding neighborhoods and MPA’s community to try and lift people up if they were feeling down, or to bring a smile to their day. What music do you like to listen to while you work? Well, I am a semi-professional classical singer, so often I have music that I am learning going on in my mind as I work. I also have 2 children, so depending on what they are enjoying at the moment (like tonight it was “Somewhere Over The Rainbow” and a song from “The Lion King”) I might have that in my mind! I love to listen to the silence of the house, to just feel peace at night time. I love being able to unwind like this, rather than sit and vegetate in front of the TV (which I used to do quite a bit!). I have to say that by seeing what others have been able to make, do, and dream, has allowed me the freedom to believe in myself, and that I can try my hand at things too.